St Hilary's Hits the Road! 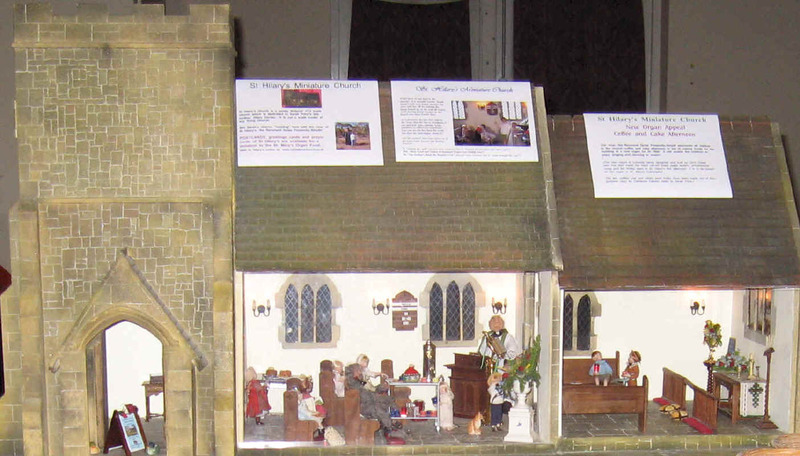 We always enjoy taking our miniature church to our own church, St Mary's Church, Cubbington's fairs and events held to raise funds. 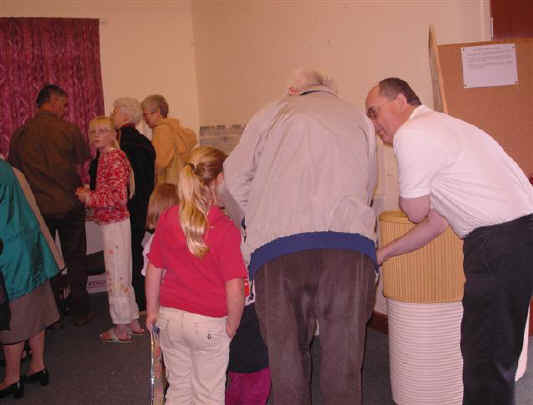 See below the interest we generate from many of our visitors at various events we have attended over the last year (2006). 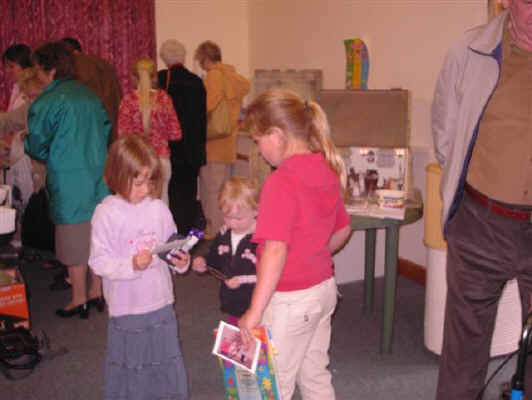 We enjoy giving away various items at these fairs in return for donations to different church appeals and funds including prayer cards, greetings cards, booklets and postcards. St. Mary's Organ Fund Coffee and Cake Afternoon. 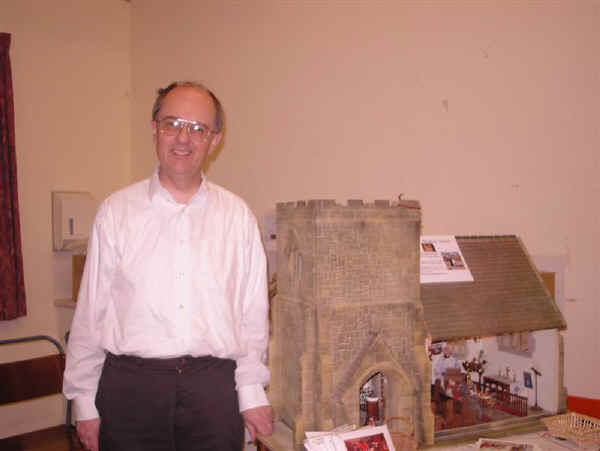 Peter, the organist at St. Mary's, asked us if we would be happy to take our newly extended St. Hilary's Miniature Church to the choir's Coffee and Cake Afternoon held in the village hall on Saturday 9th September 2006. They hold this event regularly in order to raise funds that are used to maintain and restore the church organ. Andrew poses here just after we had set up the scene for the visitors! 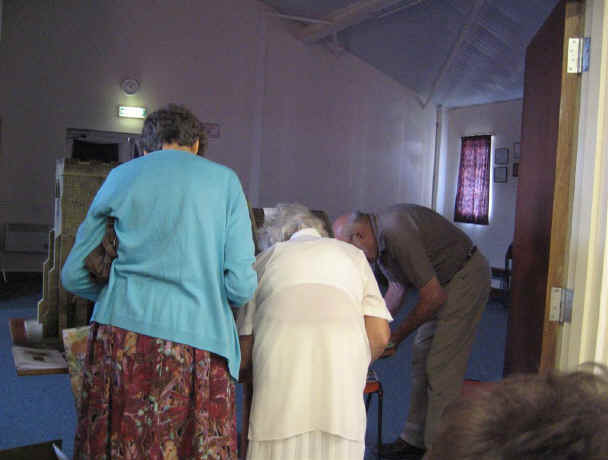 The newly extended church quickly becomes very popular as people happily accept the newly printed booklet giving "The Story of St. Hilary's" as told by the vicar, Reverend Gyles Ponsenby-Smyth! We were delighted to receive many positive comments from people who enjoyed reading the booklet "The Story of St. Hilary's". 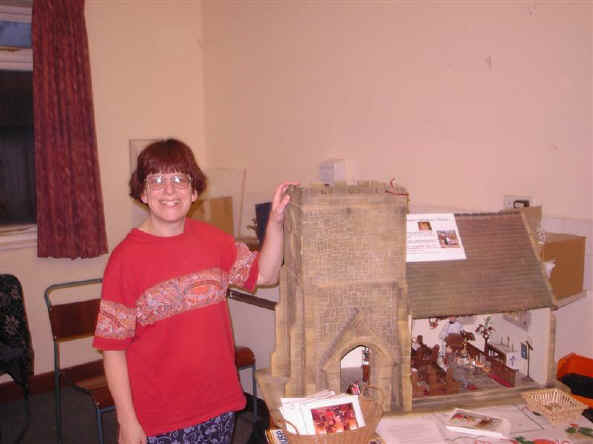 We couldn't help but think that Hilary, Sarah's late mother, would be rejoicing in heaven to know that a miniature church in her memory would be bringing so many blessings to people far and wide. This positive thought sent us home very happy. 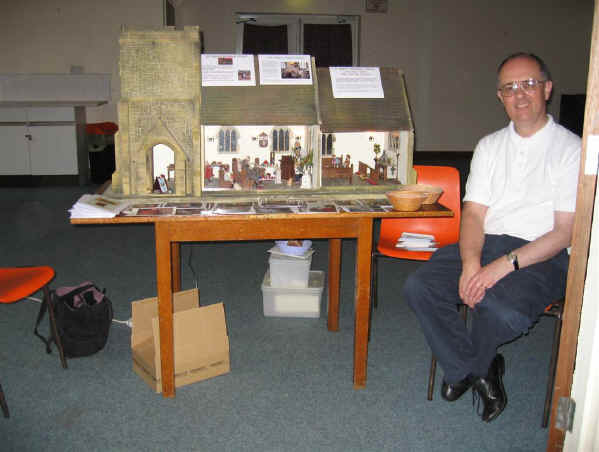 Andrew poses with our little church whilst it was quiet! 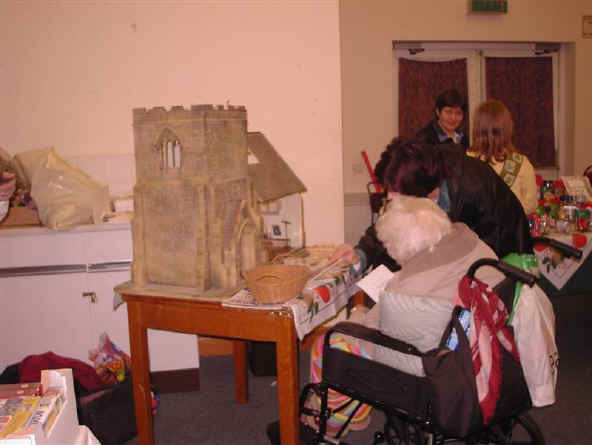 St Hilary's attracts people of all ages as can be seen here! 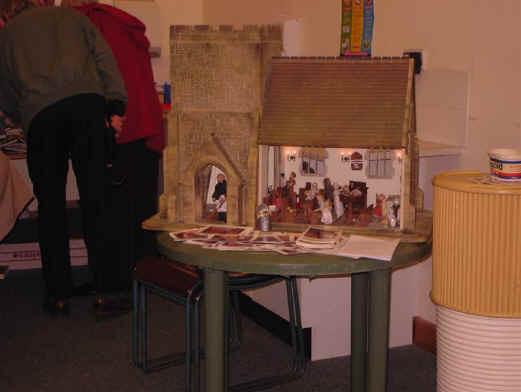 Sarah shows of the Christmas scene inside St Hilary's church. 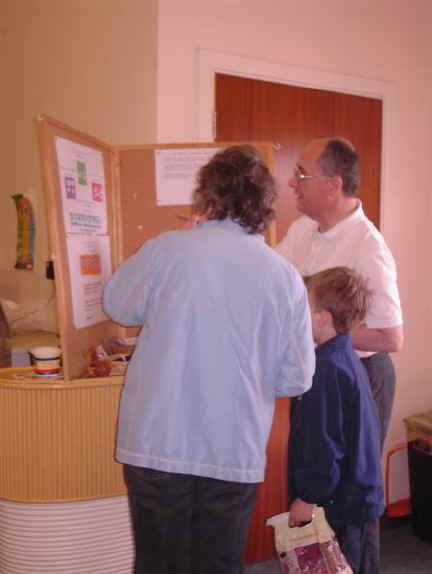 We were thiilled to raise £30 for church funds which was even better than our efforts at the Summer Fair in June 2005. We had set up our Cleaning Day scene for our visitors. 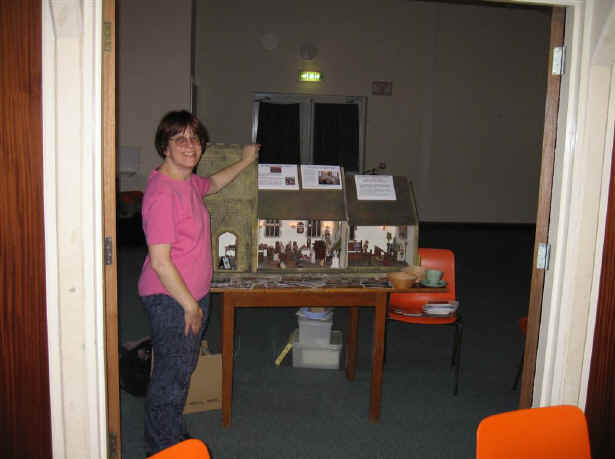 The church can be seen here soon after we had set it all up. Our dear Rev. Ponsenby-Smyth is stood at the door in his penitential pinny inviting all visitors to consider joining the cleaning rota of St Mary's if they feel so inspired! Sarah's sister's hand crafted bin of church rubbish is displayed for all to see. Visit our Cleaning Day to find out what was in it! We have created many different scenes (some are on this website!) which have been photographed and turned into postcards. You can see the postcards scattered about here. We give these away to visitors in return for a donation to the church funds. In addition this time we included miniature 1/12 scale postcards and greetings cards replicating many of our full size postcard scenes. 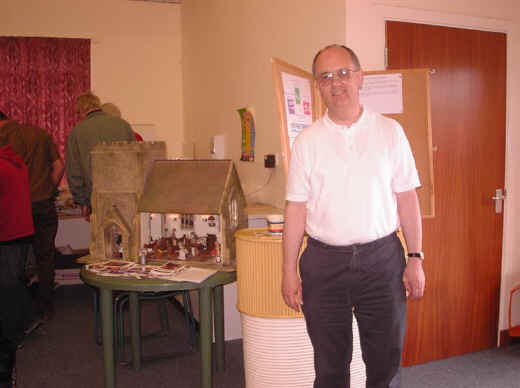 Andrew poses in front of our board display which also houses our miniature postcards and greetings cards. 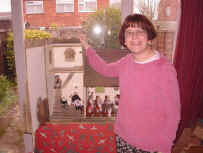 .Our miniature 1/12 scale greetings cards and postcards attract much attention. Andrew helps the undecided decide! 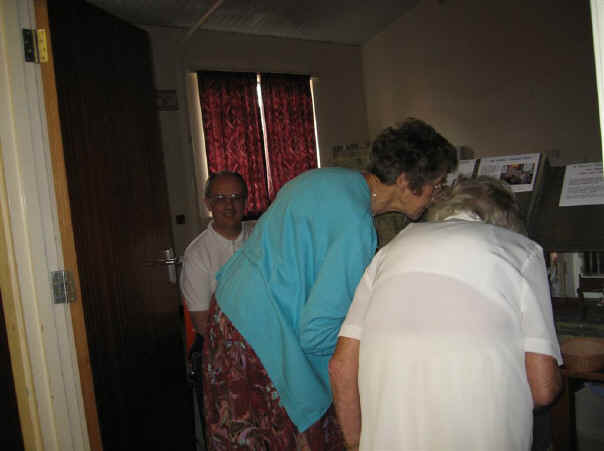 It is a good job we provided two magnifying glasses for people to see how well the pictures looked magnified. Andrew helps three children and their grandfather choose a postcard each. Oh what a decision to make! The three children each peruse the postcard they have each chosen to take home with them to remind them of St Hilary's! 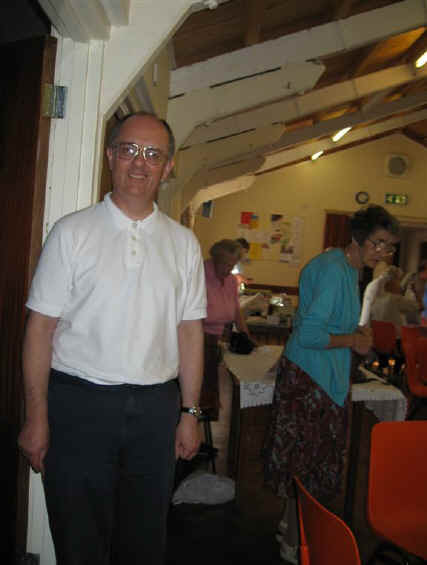 We were pleased to raise £15.95 for St Mary's church funds.